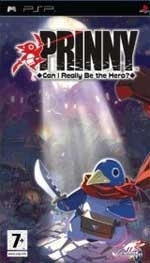 Review: Prinny: Can I Really Be the Hero? 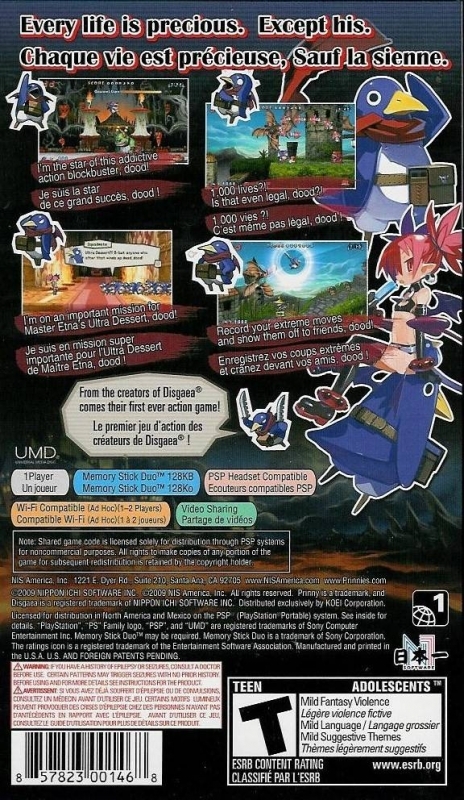 Nippon Ichi Software’s (NIS) latest entry to Disgaea is a platformer, a first for their previously-tactical-RPG series. 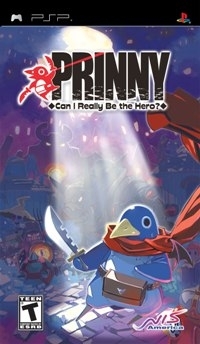 Based around the penguin-like prinnies, NIS has dropped the Disgaea name in favor of "Prinny Can I Really be the Hero?". The game retains all of the humor, story, and difficulty Disgaea fans love, while providing a very unique platforming game. 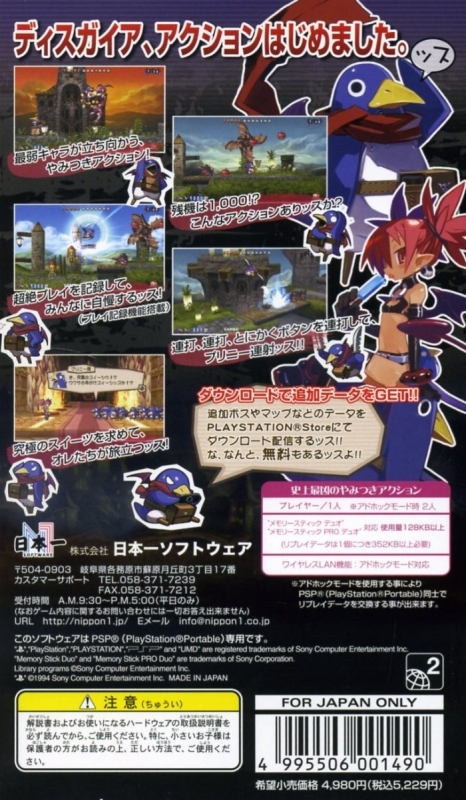 The premise of the game is this: a prinny stole fan-favourite Etna’s desert, and so she commands her Prinny Squad to go out and make her an Ultra Desert. Seems simple and non-life-threatening enough, right? It’s not. The squad is made up of one thousand prinnies and therefore you only have one thousand lives to complete the game. While that seems a little excessive, you’ll want a lot more on the Hell mode, when it only takes 1 hit to die. As a prinny would say, "this game is hard dood, ouch." One of the many bosses in Prinny. The game reeks of Disgaea style and presentation from the very beginning with the voice acting, the varied sprites, and the absurd story. Much like most of NIS’s work, Prinny's visuals consist of 2D sprites on top of 3D environments. While basic, it looks very nice and represents some of NIS’s best 3D effects in a game. The simplistic style works well and is very pleasing to the eye--the 3D backgrounds are very true to the 2D art style Disgaea is known for and looks good in motion. Though this is NIS’s best looking-3D, it still looks simplistic enough that it could have possibly been on something like the PS1. It’s far from jaw-dropping, but the game runs smoothly at 60 frames per second, and pulls off the style well that the sparse backgrounds are somewhat forgivable. The story of Prinny: CIRBTH, is the standard fare for Disgaea: Prinnies are scared to death, Etna is as evil and funny as ever, and everyone else is insane. Still, the story is very creative. There are a lot of laughs, and it's rare for a platformer to have such an extensive story. It's not very deep, but the writing is gold--this is one of the funniest games on PSP. In the end the story has a couple of twists, with several endings, and is very solid for a platformer. I wouldn't piss her off if I were you dood! 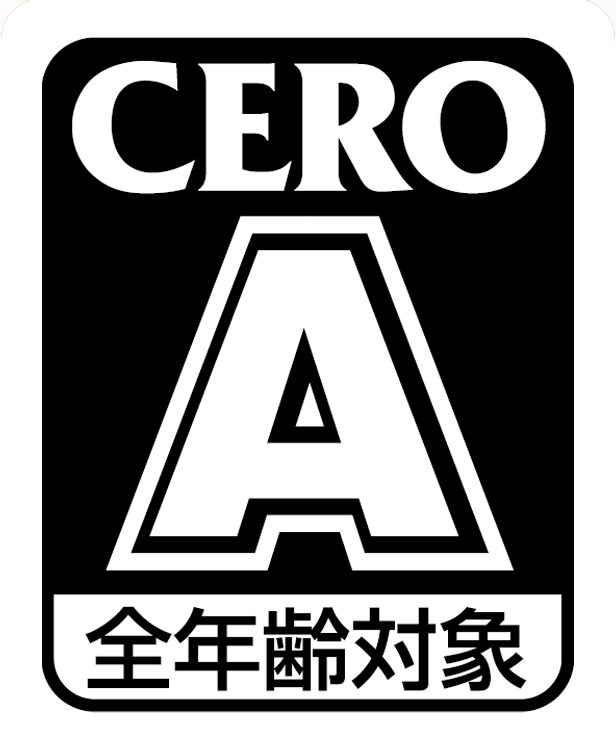 Prinny: CIRBTH's music follows the style of past Disgaea games, which is a good thing since that means it rocks. Most dialogue in the game is voiced--and voiced well, might I add. In fact, it's done very well, and the actors pull off the humor perfectly. Sound effects are plenty, varied, and pleasing--there is very little annoying repetition. All of the audio meshes very well. The music fits the tone of the game, the voice acting is well done, and the sound effects themselves are superb. Simply awesome! The game plays like a basic action-platformer. There's your standard jumps and melee attacks, a jump attack, an insane running ability, and the genre-typical ground pound that can be used to stun enemies. 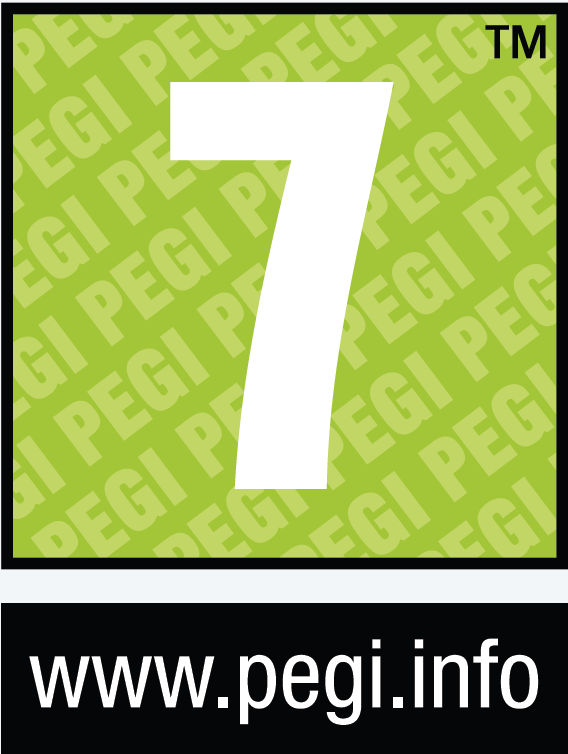 The game also sports a points system that contributes to your overall grade at the end of each mission. You gain points by killing enemies, ground pounding them enough in one combo to make them drop points or health items, or just snagging deserts found throughout the missions. While the game is rather simple on the surface, there is plenty of depth, and made it is quite fun. Two bosses at one time? Dood that's brutal! Prinny has a variety of epic boss fights (including secret ones). In each boss battle, you must stun the enemy/enemies to inflict maximum damage. Each of these enemies can be very difficult and frustrating to the point you want to smash your PSP if you’re playing on hell mode, while on normal mode they’re still tough and rewarding when you beat them, it just gives you a better chance of figuring out their patterns. Beating the bosses is very satisfying, especially when you've died repeatedly and finally luck up and kill them. At this point, all there is to do is express a giant YES! There are also a few non-platforming segments to break up the action every once in a while. Some levels have drivable vehicles, including a flying ship that spams laser beams, a giant tank, and a mechanical pogo stick which, of course, shoots lasers! On top of all this, the game puts you on a “ten hour limit” which means each mission you beat an hour is taken away until Etna kills you. It's not real-time, but for the first six missions (that you may play in any order) the hours tick away and the game becomes progressively harder. So, if you save the 'first' mission for last it will be much harder than it would have been at the beginning, which is one of the things that makes this game really unique, as well as encouraging multiple replays. 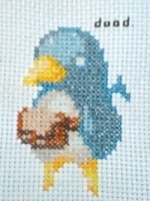 It slices, it dices, it minces, it takes care of all your cutting needs, get your own prinny today! Now, with a platformer chock full of so many goodies, what could go wrong? Well, sadly, it does have some issues. Controlling the prinny can be rather stiff at times--unlike many platformers, you don’t really gain momentum while moving outside of the run technique. The only way to control your prinny mid-jump is to use the double jump to move in another direction, but if that direction is into an enemy or hole you’re boned. That’s not to say it’s terrible but in some situations you may have jumped without seeing an enemy that was off screen and it will mean the difference between life or death (and then replaying that really tough area of the level over again *shakes fist*). It doesn’t break the game, it just makes it a little harder and you’ll need to learn where enemies are on tough areas. Prinny is full of replay value, collectibles, unlockables, and reasons to go back through the game time and time again. The main game can be beaten in about ten hours (if you’re lucky, playing on normal, and most likely played the game through once before) but all the side things to do, such as collecting the dolls, music, and letters, can extend the life about ten more hours. Add in replaying the first six missions to beat them on each hour, playing through to get the multiple endings, unlock the extra characters, fighting the extra bosses, and trying to achieve the highest rank on each mission and you’re looking at a good extra thirty hours at least. A little nod has to go to NIS for creating downloadable content for the game (which few PSP games do). While it is paid DLC, it does help to extend the life of the game. Overall, this is a very solid package--the game comes with a copy of its soundtrack and a print of a Prinny: CIRBTH Penny Arcade comic, which makes Prinny good bang for your buck easy. In the end, Prinny: Can I Really be the Hero? 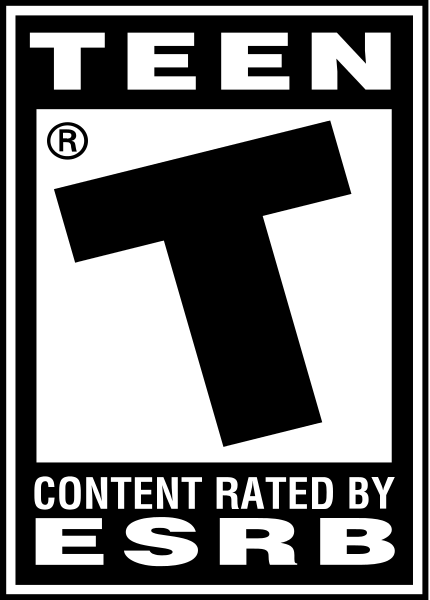 (say it ten times fast I dare ya) is a very solid platforming game, which is only held back by a bit of stiff jumping, and its difficulty may alienate a few buyers. 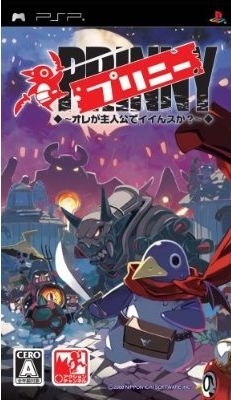 Without these issues, this game would have been an amazing package, but as it stands Prinny is one of the best platform games on PSP regardless and we can only hope for a sequel that fixes the few issues it has. Do yourself a favor, dood, and check out this game.